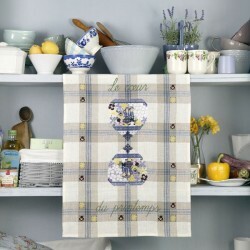 Perrette Samouiloff's Tea towels There are 19 products. Wild mushrooms, crunchy nuts, cheeky squirrels - here is a seasonal tea towel which welcomes the arrival of autumn. It completes the series designed by P.Samouiloff. 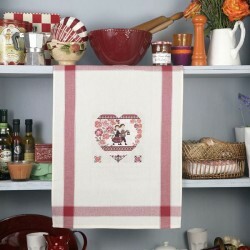 A few cross stitches on 5.5 count Aïda give an autumnal touch to your kitchen. 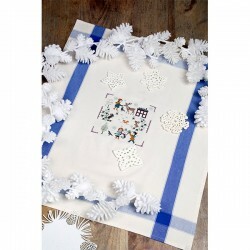 Snow covered houses, little figures and mountain animals all express the joys of winter. 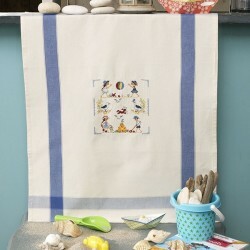 This tea-towel reminds us of all those beach games with our beloved little ones building their wonderful sandcastles before going off to play ball. Just the thing for cleaning off those tiny hands all covered in sand ! 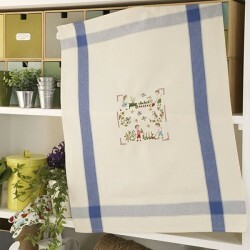 What a commotion on this cute tea towel! Perette Samouiloff's adorable little characters bustle about the kitchen cooking biscuits, pastries and cakes. A delight for every embroiderers eyes!! 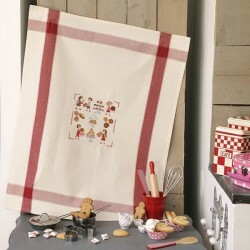 What a commotion on this cute tea towel! Perette Samouiloff's adorable little characters bustle about the kitchen cooking biscuits, pastries and cakes. We love the ecru and grey weave with a red grid. A delight for every embroiderer's eyes!! Pink radishes, tender green seedlings, little lettuces, here is a cutesy tea towel telling a crunchy tale! A few fresh stitches simply embroidered on 5.5 count Aïda to bring some Springtime colour to your kitchen. 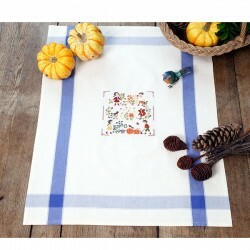 This tea-towel , reflecting the sun-drenched colours of cornflowers, violets and buttercups, is a real joy ! It is as delightful as a sunny afternoon walk in the garden in the month of May and will bring a touch of real gaiety to your kitchen ! 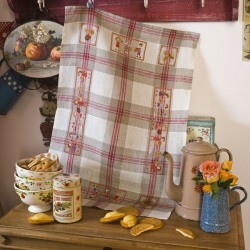 This tea-towel, with its heart-warming rose and orange tints, recalls the season when autumn leaves fall to the ground. Two children, surrounded by September flowers, are walking along at twilight and the gleam of their little lantern invites us to partake of a cup of deliciously warm chocolate in the kitchen !